Real Estate Crowdfunding or REITs? Which is the best option? Investing via a real estate crowdfunding or REITs is a common question. Whether an Investor should invest in property via a real estate crowdfunding platform instead of directly into a Real Estate Investment Trust (REIT) is a discussion that deserves some full analysis and will depend on each individual investor. What is a REIT and Real Estate Crowdfunding? A REIT is essentially a corporation that owns and manages a portfolio of income-generating real estate properties which may include commercial, industrial, retail or a mix of these real estate assets which would not otherwise be available to the individual investors. A real estate crowdfunding platform offers both debt and equity investment opportunities for individual investors who can invest access to high-net-worth directly to make money in the real estate market. 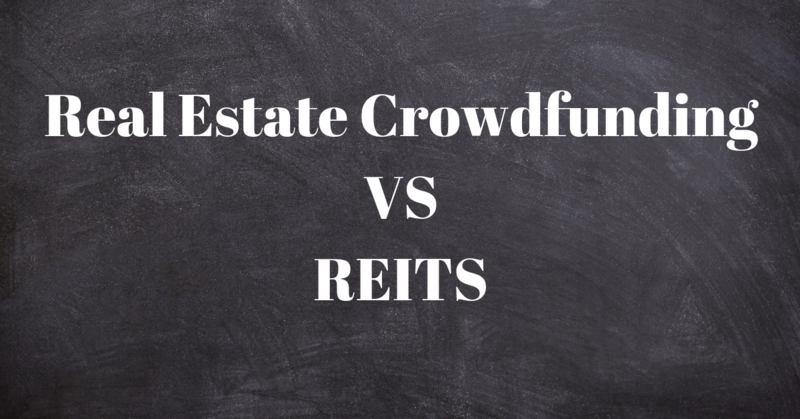 Real estate crowdfunding platforms and REITs are similar in a lot of ways. Both offer investors balance and diversification from the traditional equity and stock markets, a value from both the current income produced as well as the long-term appreciation of the underlying real estate property. The main difference, however, between a crowd investing platform and a REIT investment is that via a real estate crowdfunding platform, you can invest directly into several commercial real estate projects whereas, with a REIT, you are investing in a corporation that in turn invests your money into real estate. The return on an investment from a REIT can be in assets other than real estate. Consequently, real estate investment platforms offer investors more selection and transparency in investment opportunities than a REIT since investors can select each pre-vetted investment opportunity personally. Direct property ownership benefits from the power of leverage (up to 80%) whereas REITs are generally leveraged at or less than 50%. Higher leverage means the potential for higher (because you can buy more property with less equity). Real estate crowdfunding website can make a quick sale unlikely while REITs are extremely liquid and are traded daily across the financial markets, So, the ease of REIT investing is trumped by the customisation opportunities in real estate crowdfunding. When you invest directly into a real estate asset, you know exactly what you are getting and thus the process is transparent and you maintain a certain level of control. On the other hand, when you invest in a REIT you are buying into a corporation that owns a pool of properties and you may not know exactly where your investment dollars are going. Crowdfunding investors are able to diversify their investment portfolio by investing smaller sums in several investment options. But this will never achieve the same scale as investing in REITs, which often own thousands of properties across different property types and geographical locations. Crowdfunding investors must make individual property investment decisions without necessarily having the expertise or the resources to do. However, investing in REITs are potentially less risky due to expert opinion that may be provided. In a rising interest rate environment, investing in real estate may be a smart move for your individual investment portfolio. Interest rates are rising because the economy is strong and that bodes well for the real estate sector. Whether crowdfunded real estate investments or REITs are best for you is a matter of personal preference and the needs of your individual investment portfolio. Crowdfunding finances individual projects, whereas a REIT is more like investing in company stock. this funds typically invest multiple sizeable real estate projects, and investors in REITs collect dividends based on the net profitability of all the investments in the trust. If you want to invest in single projects that are easier to monitor independently, you might prefer investing in real estate crowdfunding projects. But if you're going to spend in a conglomerate of large investment ventures, you might prefer investing in a REIT. What are REITs and what can you invest in?